Here in New York, sometimes you have to get downright creative when it comes to storage when you live in the big city of Manhattan or Brooklyn. The designers from California Closets put together several options on how to help. The garage is a great place for storage. Why? Because more often than not, you’re the only one accessing it. Custom storage cabinetry in the garage takes into mind your quantity of storage and your design tastes for a beautiful look. Holiday décor, tools, sporting and gardening equipment and other items can easily find a home in the deep storage cabinets, drawers, shelves and baskets. Take advantage of every square inch by utilizing precious wall space. Drawers and baskets make it easy to go from playing with toys on the floor to placing them back in their designated storage spaces. Integrated desks create a space for working on projects or doing homework. Desk storage, from shelves with doors to drawers, can corral school supplies. Have you ever thought about redesigning your laundry room so that it has plenty of storage potential? In addition to having drawers, cabinets and shelving to organize your laundry and cleaning supplies, the utility room is a great place to store materials and conduct projects in. Upper storage and shelving for paper, scissors, tape and more will give you a dedicated space to work (with the addition of open counter space). 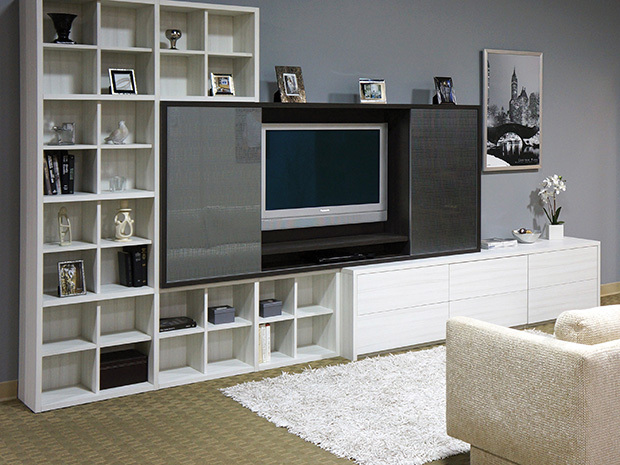 If you love to watch movies and entertain, make it multifunctional by incorporating storage within. Deep custom cabinets, drawers, baskets, and shelving offer plenty of space to store miscellaneous items for your home, and guests will never know. Selecting a beautiful material and finish will dress it up too, elevating your home and increasing its value. To get a customized one-on-one approach, schedule your complimentary in-home expert design consultation today here in New York. Or, visit our Upper East Side or Tribeca showroom to see all of the options available. Every project we conduct is completely customized and unique to fit each client’s budget, goals and home.